Um... at 159.4mm, it's taller than the Nexus 6. I don't think that really qualifies as "average" for a 5.7 inch screen size. Maybe the entire purpose of this device is to clear out inventory of the Moto N6. The purpose of the device SHOULD give the best representation of Google. But there are some key issues. 1. Ugly design with hideous camera hump 2. Screen to body ratio is looking pretty bad 3. SD810, aka Hotplate 4. Camera and battery life already looks to be concern Google, wtf is wrong with you guys?? Pick a manufacturer that can build a flagship you are willing to put your name on. WTF you guys thinking? There ain't no Googliness in this B***h. Just ugly and laziness. Go to your Somsong . Hands off Nexus . They should have ditched sd810 and use kirin 950. Only a sound option if Huawei's willing to let Kirin 950 adhere to GPL compliance to fit the Nexus badge. I don't think so. Doing that will either force their hand to open up the entire Kirin line OR start to after 950. Yeah, I don't think that I want to carry around a shower radio as my phone, so, yes, I agree it's hideous, but calling it an 810 Hotplate? No way. I'm on a LG G Flex 2 with the 810, and it's awesome fast and on 5.1.1. Its not the hot plate it was originally. The version in the Nexus Huawei should be an updated hardware version which is supposed to be even further improved. The thing will be smokin fast...and not because it's a fire log. AMOLED? then I'm in. I would like it to have the new Mate S design though. This phone is extremely ugly. 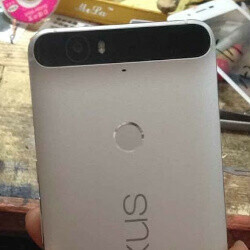 Why Nexus phone often ugly design! Is the design request by a person from Google that don't have sense of beauty? This has a ugly back but the Nexus 6 & the Nexus 5 were great looking phones. Love my Nexus 5, but the Nexus 5x looks just as good. They wont use this design. i feel samsung should have got the job for this nexus !! ( or atleast for the next nexus now) ram should have been 4 gb in this......considering all the previous nexus devices were the best in specs at their time. That black hump makes this phone look like crap. Seriously, most OEMs seem to lack experience in design department. Google should have asked LG to make the 2 versions. It's just got terrible design if are to take the renders seriously. Gosh.. I hated the nexus 5 more than any other nexus. Why? Performance wise, it is the best phone I've ever used. I like how you are trying to gain some credibility around here. Pls just smack yourself with a mop, patriot. PA I think its time to get rid of this demon (patriot) trough some exorcism or other shi* lol. LOL gain some credibility? I'm not on here to earn respect of others. I'm here to discuss mobile phones. So unless you have anything to add to the convo, you can stop stalking me everywhere on phonearena. Eh. I am the opposite. I thought the Nexus 5 and Nexus 10 were the two best by far but people usually don't agree, especially with the Nexus 10. The reviews agreed with me though. G2 rapes all phones in history, is the best phone ever made, with least issues, and biggest performance (feature set) jump ever. Not good. Will go for Mi5 as and when it launches.